Engineered wood siding is classically beautiful and made from strong, water-resistant material. Trinity Exteriors, Inc is the go-to siding contractor in Minnesota, serving Minneapolis, St. Paul, Eden Prairie, and areas nearby. Contact us today to find out more about our siding replacement services and to schedule your cost estimate in Greater Twin Cities Metro Area! This home had aging cedar siding that was chipped and cupping. Trinity Exteriors installed new LP SmartSide engineered wood siding and trim. The shake was pre-finished with the homeowner's choice of custom color: Outerspace, and the trim was finished to match. Crews also put on Tyvek house wrap to meet building code and prevent moisture from entering the house if the siding fails. There’s nothing like the look and feel of "beautiful" combined with "new!" Especially when it's a stunning make-over to your home’s siding,shingles, and trim. Pull in that driveway and you'll feel accomplished when your home looks its best. That's what happened with these Eden Prairie homeowners. Compare our before and after here when Trinity was called in to create a look and feel that encompasses less time maintaining a home and more time enjoying it! The rich beauty of this new look include: Ledgestone in Sterling by Boral Versetta Stone, incredible siding durability with Hardie Shingle Straight Edge Siding in the color of Aged Pewter and Beautiful white trim that wows by LP products! Call us today for a free make-over estimate that will make you proud for decades to come! 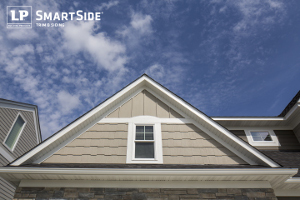 As the global leader in engineered wood siding, LP SmartSide has developed the quality siding product designed for superior durability and strength. If you're looking to replace your siding or install brand new siding for your home, consider the benefits of engineered wood siding when making your choice. Durability. Designed with the strength to endure harsh weather, impact damage, heat, and ice, LP SmartSide siding is completely water-resistant and built to last. 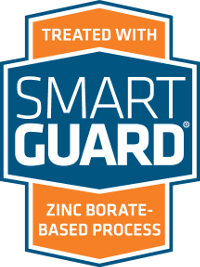 The material is specially treated to resist termites and decay. Aesthetic appeal. Available in a wide variety of styles and colors, engineered wood siding has the versatility to create a custom look to complement your home's appearance. LP SmartSide siding provides you with a choice of both textured and smooth finishes and is available in long lengths to reduce seams and improve curb appeal. Affordability. Engineered wood siding is built with an innovative design for fast, efficient installation. This will save you both time and money, and the siding installation process will be completed with minimum disruption to your home and daily schedule. Engineered wood siding from LP SmartSide is the best choice for homeowners looking for a beautiful wood appearance with lasting durability. Contact the siding experts at Trinity Exteriors, Inc to find out more about our siding services, and schedule your cost estimate for LP SmartSide siding installation today! We proudly serve Burnsville, Minnetonka, Cottage Grove, Inver Grove Heights, Savage, Chanhassen, Rosemount, and throughout Greater Twin Cities Metro Area.